You are roused from slumber by the specter of a huge floating eye. "Attention Manhunter!" it says. "There has been an explosion at Bellevue Hospital! Investigate." With that, it leaves as silently as it arrived. You yawn, blink the sleep from your eyes and retrieve your Manhunter Assignment Device (MAD). "So," you mumble to yourself, "this is the life of a Manhunter." 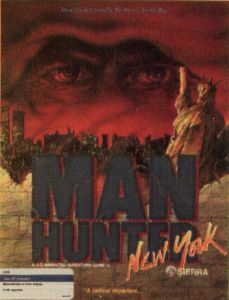 Thus begins Manhunter: New York, from Sierra On-Line. It seems the Earth has been invaded by an alien race called the Orb Alliance. Their rule is iron-fisted, and you have been chosen to be their servant. All humans have been implanted with a tracking device, but the device's design is faulty; it loses its signal if the tracked subject goes underground. Therefore, the Orbs employ Manhunters such as yourself to investigate suspicious actions by your fellow humans. Your job is to identify the perpetrators of various crimes. You will be hindered by your fellow humans, as well as the Orbs in some cases. Death in this world comes swiftly and frequently—most often at the hands of your fellow man. Your MAD will provide valuable assistance in tracking and identifying suspects. Generally, the first thing to do after being given an assignment is to consult the tracking module of MAD. This will show you where your suspect has been recently. Your job is to trace his path and determine what he has been up to. If you can learn his name, the MAD info module will give you pertinent data, including his address, and access to his apartment. Should the trace show contact with another human, you may switch the tracker to this new suspect. Early in the game your choices of where to go are limited, but as you learn more, the Orbs will allow you to travel to a greater variety of locations in the course of your work. 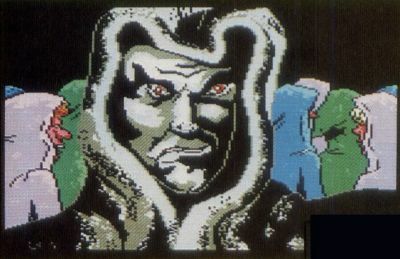 Sierra is most famous for its King's Quest series, featuring a novel adventure-game design in which you use a joystick to move your on-screen persona, which you see in a third-person perspective. Manhunter is in some ways more traditional in that most of the game is viewed through the eyes of your alter ego. There are some third-person scenes, primarily of yourself getting slain in some exotic ways, but these are usually decorative in nature. There is little text input involved, only the occasional typing of a name or brief phrase. 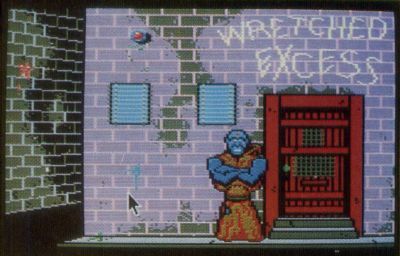 Generally, whatever is visible to the Manhunter will be shown on your screen, along with a cursor. Moving this cursor over different parts of the screen will cause it to change shape. These shapes allow you to choose from available options, i.e., a magnifying-glass shape allows a closer look at something, an arrow shape allows you to move in the direction of the arrow. Sierra has gone out of its way to make the game easy to use. You have the choice of mouse, joystick, cursor keys or numeric keyboard to move the on-screen cursor. The various special commands (save, restore and the like) can be called either with function keys or drop-down menus. The drop-down menu bar is not usually visible; a press of the right mouse button will bring it into view. Unfortunately, there is a bug in this segment of the program. Several times the bar would start popping into view, flashing drop-down menus on and off. While a definite distraction, this bug is not serious, and a tap or two on the escape key fixed the display. Another convenient feature Sierra has included is demonstrated each time you are killed. 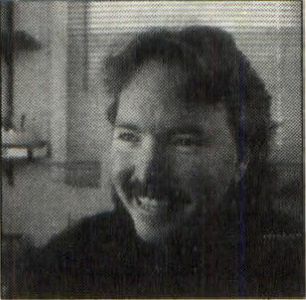 A picture of Manhunter: New York's creators appears with a dialogue balloon offering advice. Then they "... take you back to a few moments before you made your fatal error." Manhunter will run on either color or monochrome systems, although I'd recommend the color. Not only is it more visually pleasing, but it's easier to see small items lying about that may have significance. The game comes on five single-sided disks (Sierra has stated that future ST programs will come only on double-sided disks, much to the dismay of many 520ST owners) and is keyword copy protected (you must type in a word from the manual in order to load the game). Kudos to Sierra for using this style of copy protection. In addition, a program is provided that will automatically install Manhunter on your hard disk. Again, thank you Sierra! It's about time companies started realizing the prevalence of hard-disk users among the gaming audience. If you don't have a hard disk and are apprehensive about shuffling five disks in and out of your disk drive, be assured that disk swaps are infrequent and unobtrusive. Being an adventure wimp, I sometimes make it a habit to log on to telecommunications services and download hints on whatever game I'm playing, sometimes before I've really started playing it. (Taboo, I know, but I hate becoming utterly frustrated before I become involved in the game.) I did this with Manhunter, and it was a mistake. The game was not as difficult for me as I thought. Most of the puzzles had commonsense solutions, more so than I've found to be true in the majority of adventure games. To me this was a plus, but I think it's really a matter of personal preference. One facet of adventure gaming that I certainly did not miss is the guess-the-right-word syndrome that plagues many text and text/graphic adventures. Several arcade sequences are embedded in the game. One arcade sequence in particular annoyed me. It took me over three hours to get past it. To say I was frustrated would be an understatement. If I want a difficult arcade game, I'll go out and buy one, thank you very much. If I buy an adventure game, I want puzzles to solve and a good plot to enjoy, not an eye-to-hand coordination workout. Still, I must admit, most of the other arcade sequences were interesting diversions, and more importantly, provided hints that were vital to completing the game. I enjoyed Manhunter: New York, and am happy to see that a sequel is planned. The grapevine tells me this will be Manhunter: Chicago, but that remains to be seen. I can heartily recommend this game to virtually anyone. The only exceptions are those who either detest, or for some reason cannot play, arcade games. The choice of interface makes it easy to play, the pace is quick, the plot enticing. Graphics are up to Sierra's standard. One last thank-you to Sierra for letting us use our hard disks, and please, do buy this game; don't steal it. Sierra has made a commitment to ST owners, let's not let them down. Manhunter: New York is intended for mature audiences. Parents should consider whether their younger, impressionable children should play this game. Peter Smith lives in Sag Harbor, NY, with his in-house editor, Julie. When not in front of his computer, he is a bicycle enthusiast, a struggling musician and a poet. He can be reached on GEnie at the address Capt.Cook.